Our ancient red plum tree served as an early muse here at Upstate-Downtown. 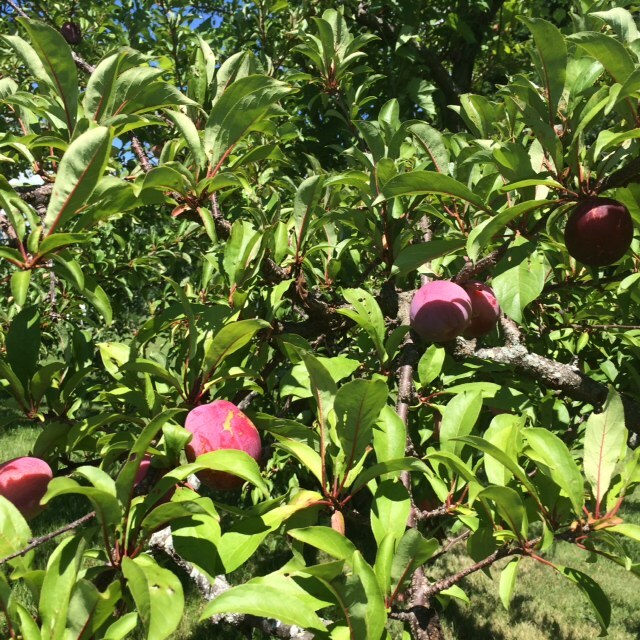 And we’ve received lots of plum goodness from it over the years. It has, unfortunately, fallen on hard times recently, a victim of “black knot” plum tree disease and (likely) old age (such trees aren’t eternal), making it essentially barren. In fact, I almost cut it down two years ago, but a late burst of new growth from the lower half of the tree put off what I considered would be an eventual coup de grace. After a brutal winter last year, however, I was pleasantly surprised by a copious bloom this spring, albeit with no expectation of a plum harvest. 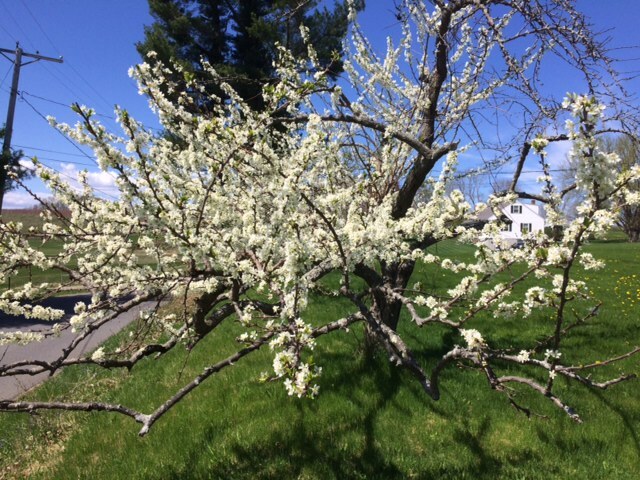 The nice bloom turned into a good fruit set, and a good season so far for tree fruit in the Hudson Valley — our apple and pear trees are faring nicely, too — has made this a comeback year for our Santa Rosa plum tree. Perhaps it’s going out with a bang, but we’ve had a high quality harvest with a respectable yield, a totally unexpected gift. As the number of ripe plums going into our fridge multiplied, I started thinking about what to do with them besides just eating them (which I’ve been doing frequently) and adding them to cleansing smoothies. 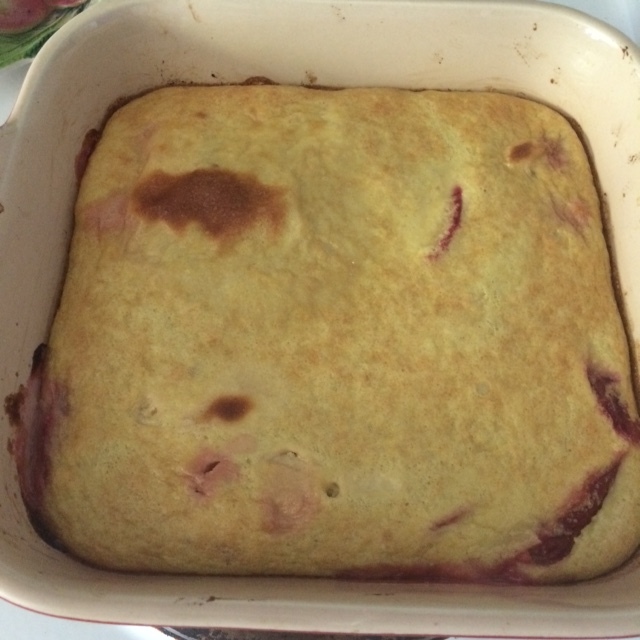 The obvious light went off last Saturday morning: I had to make a plum clafoutis! Calfoutis is a baked French dessert that combines ripe, seasonal fruit (traditionally black cherries, but plums work brilliantly) and a custard-y batter in a buttered dish. In light of Kathryn’s gluten sensitivity, though, I wanted to give it a Paleo spin, so I adapted and combined one of our old pear clafoutis recipes with a Paleo Peach Clafoutis version from epicurious.com. 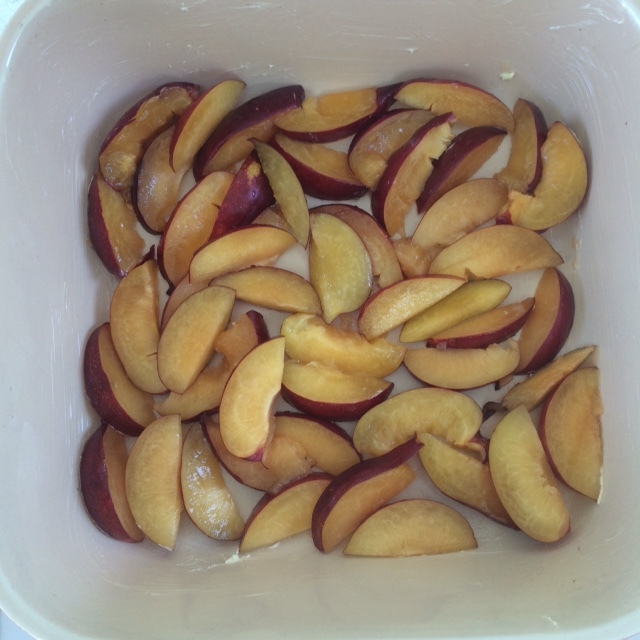 Start with 3-4 cups (or more) of sliced ripe red plums, and line them on the bottom of a well-buttered baking dish. Pour the batter over the fruit, place the dish in the center of the oven, and bake for approximately 40-45 minutes at 375 F (or when it’s golden brown on top), turning once half way through. The result: a simple and delicious vehicle for local, seasonal fruit, like red plums — especially from one’s own yard! — which is great served warm at a dinner party, or (perhaps even better) eaten cold for breakfast. 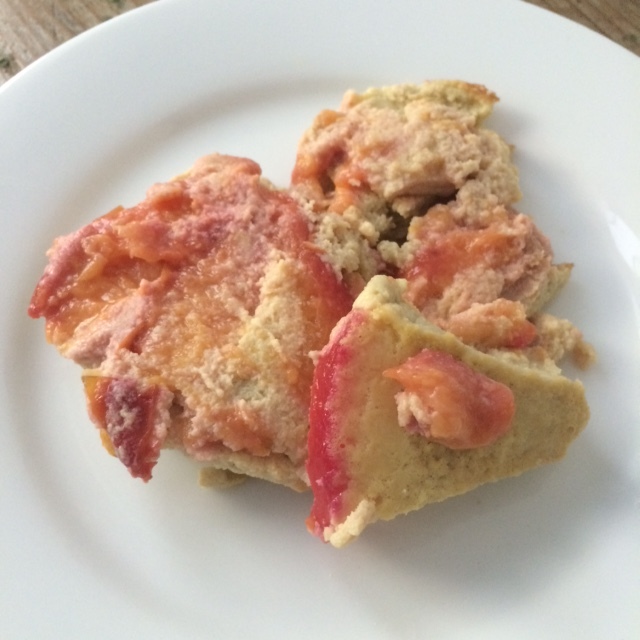 This entry was posted in At Our Farmhouse, Food, Home Baking, Hudson Valley, Local Food and tagged Paleo Clafoutis, Red Plum Clafoutis, Santa Rosa plum. Bookmark the permalink.